Weighted Blankets – Gravityblankets UK How to rest effectively? Waste Your Weekend to… Get Rest! Weighted Blankets - Gravityblankets UKBlogWaste Your Weekend to… Get Rest! Your start planning your next weekend already on Monday. But when the Friday finally comes, you don’t know what to do with yourself and you are stalled. You’ve had such an ambitious schedule, yet in fact the only thing you can think of now is a TV series and bed. Another Monday means frustration and a sense of wasted free time again. Is that right? It turns out that you can learn how to effectively do nothing and… be happy about it. This stage is very simple. All you have to do is confront your thoughts and expectations. Think about what you really feel like doing. Maybe it will turn out that instead of getting in the car to drive from point A to B again, you really prefer to sit back on the sofa and watch TV or just let your thoughts drift away for a moment. Remember to listen to yourself and find what YOU really want. Forget about life hacks served by colourful magazines and morning TV shows. You don’t have to rush to the gym to fight for a ripped body if you don’t feel like it. Forcing yourself may quickly turn out to be very discouraging! You should do whatever you want, even if it means walking around in pajamas until noon and eating ice cream in bed or staring pointlessly in one direction. Be consistent with yourself – even while being lazy. If none of the forms of rest give you satisfaction, try to give up electronic devices around you for some time. For example, you can set certain times during weekends when you go for such ‘detox’. Do not use your cellphone or computer. TV is also not an option. In other words, get rid of every electronic device. Perhaps you’ve been deciding for certain forms of rest which in fact were inefficient for you. Forced to look for other forms of relaxation, we reach for activities we wouldn’t normally choose. At least give them a try! Yes – stay in touch with… the nature. We spend too much time indoors – in shopping centres, offices, etc. As a result, we get not enough natural light and green surroundings that are crucial for the functioning of our nervous system. Natural lighting inhibits the process of melatonin production, so we feel increased energy and readiness to act because our body knows that it’s not yet time for getting to sleep. Take a walk (even on you own!) to a nearby park, sit on a bench (without scrolling through social networks) and watch what’s going on around you. Such observations are a great start in practicing mindfulness. It helps to focus your attention on the surroundings. Green scenery will give you a feeling of inner relief. Although the media still write and talk about the healthy influence of sleep, we rarely realise we actually have problems with it. If your duties and stress have been piling up for a longer time, and you don’t know any more how many hours you sleep – it is high time to order your life a bit. You need to control the number of hours slept (minimum seven hours!). If you are under a constant pressure at work and home, your adrenal glands may be fatigued, since they regenerate only between 10.00 pm and midnight. 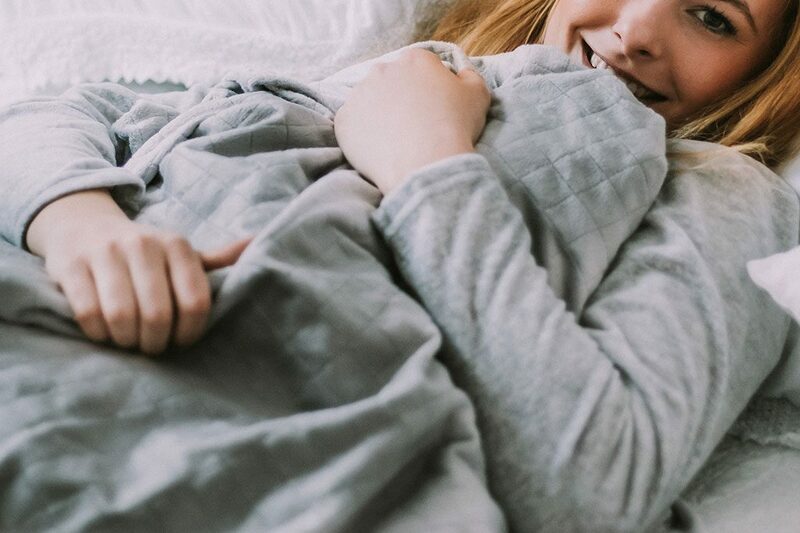 If you suffer from insomnia (or inefficient sleep), you can try sleeping underneath an increasingly popular weighted blanket (for the adults). Its special filling stimulates certain receptors in the body and reduces the level of cortisol (stress hormone) and, at the same time, stimulates the production of serotonin (happiness hormone). As a result, we wake up in good condition, calmer and relaxed. If you are swamped with documents on a daily basis, go jogging. If you are a manual worker, read a book. If you spend long days in the office or at home, make sure you go outside regularly. The point is to frequently change the environment and not to overburden oneself. If you feel you’re in full strength, bike ride may be a really cool idea. When you spend your whole day actively fulfilling your duties, it would be much better afterwards to just go for a walk in a park than to attend a CrossFit class. Or maybe you could challenge yourself and list three new things you want to try every month? This will stimulate your curiosity and willingness to engage in new things. It should be remembered that acting in harmony with yourself and your body is a form of self-respect, and not laziness or waste of time. Sometimes all you need to do is just try!